Why is it such a Rip Off? Earlier today I had one of my Facebook followers comment on a post “Why is it such a rip off?” I don’t know him personally, but know he has been following my page for 5 years so a pretty loyal follower. And I get what he is asking. But I wouldn’t call it a RIP off.…but I would agree Tahiti is an expensive destination. 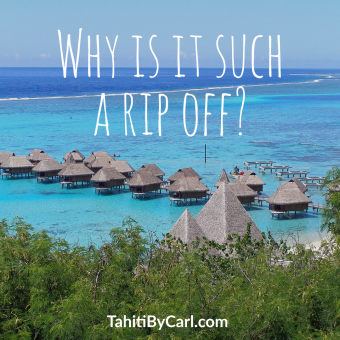 I feel there is a big difference between a rip off and an expensive destination and I know my clients who have been can attest there is value in what you get and a trip to Tahiti is well worth it! Whether ‘a rip off’ and ‘expensive’ mean the same or not is a point I won’t further debate – but I do get asked a lot why it is so expensive? Why does a trip to Tahiti cost so much? So I thought a little post here might help explain it to my followers. therefore more expensive. Additionally travel between almost all the islands must be done by flights and not boats adding to costs. The isolation makes it very expensive to import everything. Cars, boats, building materials, food, drinks and all everyday living items must be imported into the islands. Very little is manufactured in Tahiti so most items are brought in by plane or boat. 2. 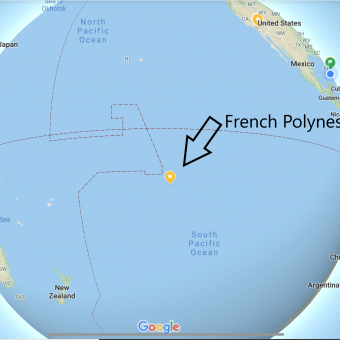 Political Affiliation – French Polynesia is a territory of France and follow French laws. Therefore it is not a third world country like many other island destinations. They have high taxes, strict labour laws, excellent medical care, a good education system and a social support network. All this costs money – especially when they operate with a small population base and in an isolated part of the world. newly built hotels have over 1000 room per resort! Supply and demand naturally drives the pricing up. However, this also creates an atmosphere of privacy and relaxed nature in Tahiti which mirrors the soft warm nature of the locals themselves. Did you know the MGM Hotel in Las Vegas has more rooms than all of the hotels on all 118 islands in French Polynesia have added up together? And that Hawaii gets more visitors in 1 week than Tahiti gets in a whole year? These are a few reasons that cause the higher prices of visiting Tahiti. But as a high end destination they are not alone in the world. Places like St Barts, Maldives, Seychelles and others fall into similar price brackets. Having visited many upscale destinations, I feel Tahiti and her islands still have a warmth and charm not found in other locations. Overall the isolation, culture and uniqueness of the islands creates a feeling and experience that can’t be replicated. So as my Facebook follower asked “why is it such a rip off?” I answer, Yes the islands comes with a price tag…but as people who have been will agree – it is well worth a visit and the memories that last forever are priceless! I hope one day all of my Facebook followers can all get down there to experience it first hand themselves and have those priceless lifelong memories. This entry was posted in Tahiti Experiences, Work with Me, Travel Tips. Bookmark the permalink.